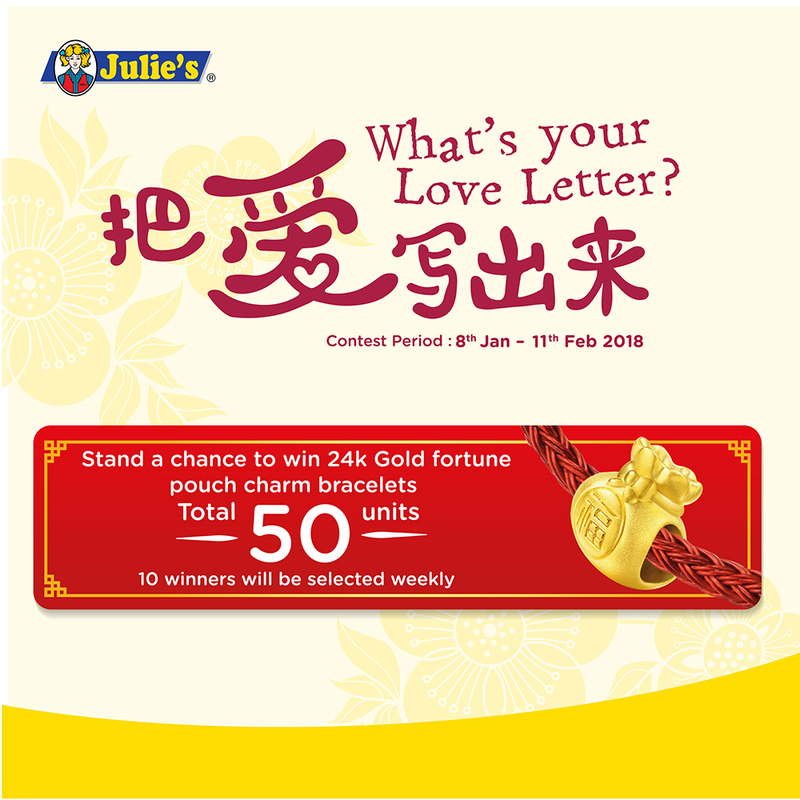 Spread the Love this CNY 2018 with Julie's "What's Your Love Letter"
It is the time of the year again where we are busy buying gifts for friends and family, and celebrate the auspicious season of Chinese New Year. 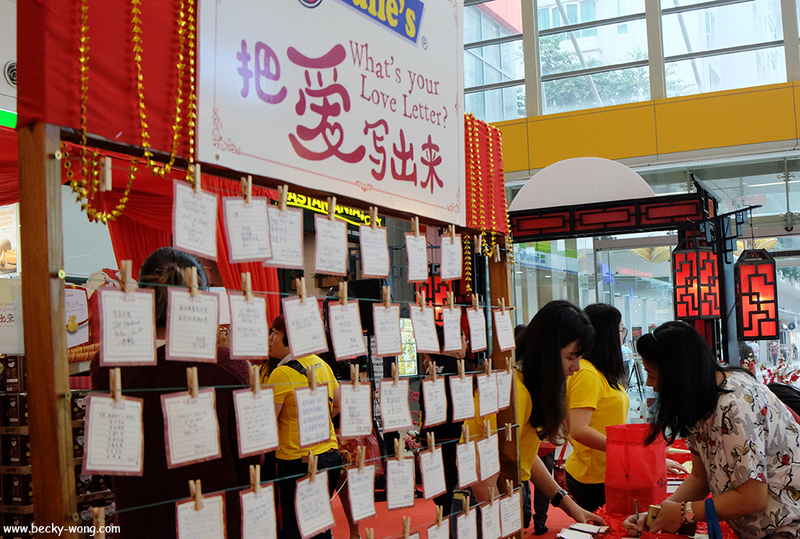 Ushering this coming Chinese New Year, Julie's has launched a "What's Your Love Letter" campaign, where you can write down your most sincere messages to your loved ones. 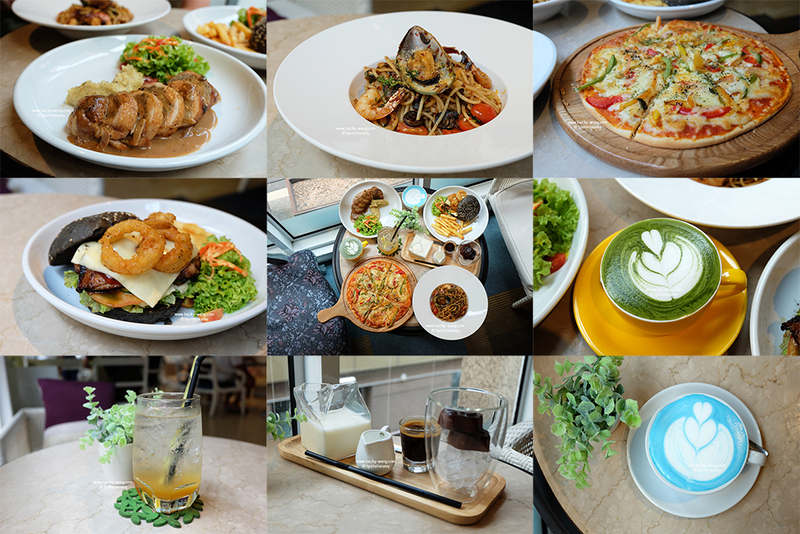 Julie's was established in Alor Gajah, Melaka in 1981. 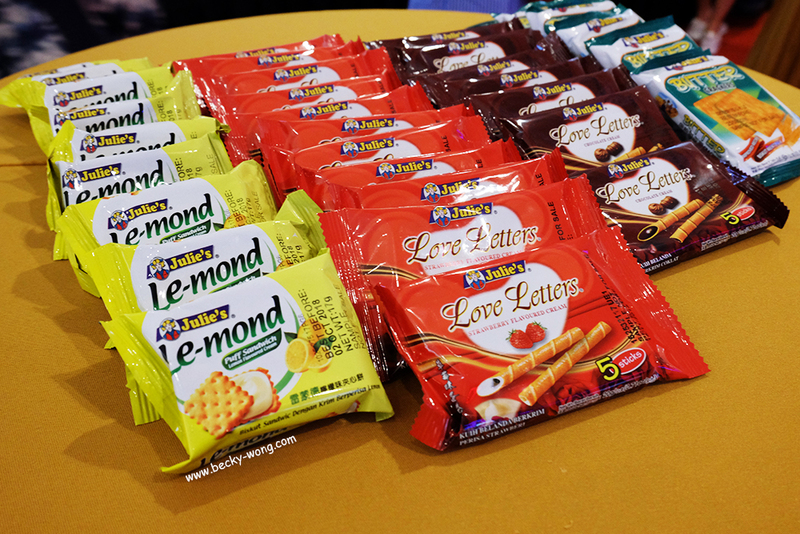 Starting from a single plant that produces crackers, Julie's product range has increased to include other types of biscuits such as cream sandwich, wafer rolls, waffles, cookies and others. With the founder's philosophy of "What I don't eat, I don't let people eat", Julie's biscuits are baked with specially selected raw materials and ingredients for their quality and nutrition value. The company is not one of the top 3 biscuit brands in the country. Since the initiation of "What's Your Love Letter" Campaign in 2015, they have received warm response from the public. 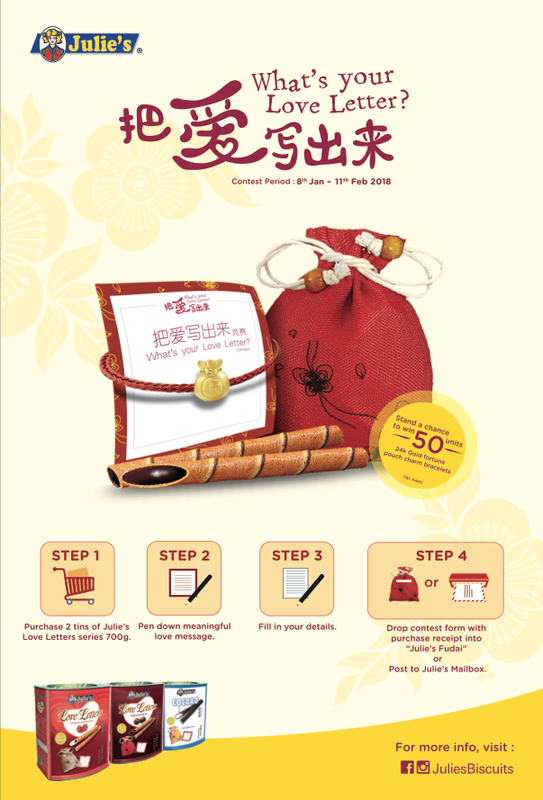 Over the years, they have done it in different ways from postcards to "Love Invites"; and this year they have launched the campaign at Sunway Velocity Mall with a different way for you to express your love. To celebrate this year's Chinese New Year, Julie's has designed a special "Fudai" along with their 700gram Julie's Love Letters. Inside the Fudai, there is a Love Note for you to write down your blessings and thank you notes to your friends and relatives. 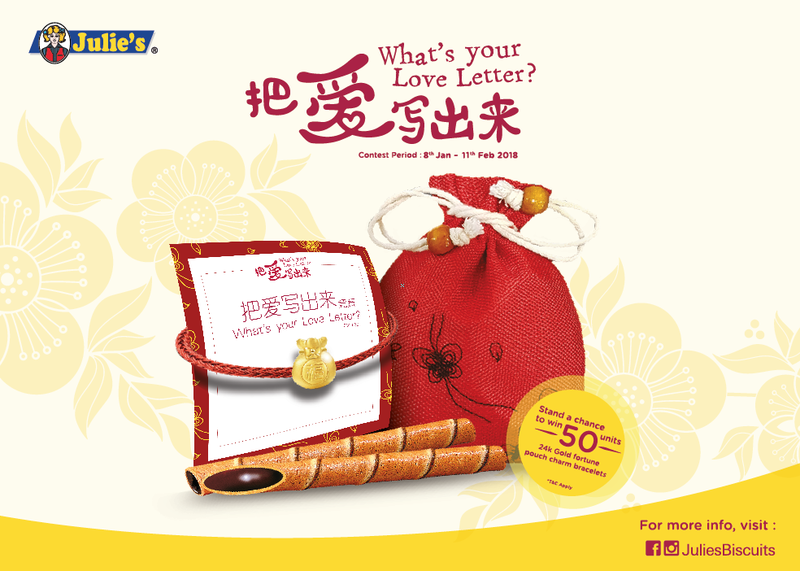 Along with the campaign, they have also launched the "What's Your Love Letter?" Contest. Purchase 2 tins of 700gram Julie's Love Letters from 8 Jan to 11 Feb 2018, and write down your love message within 20 words on the Love Note. The top 50 most touching messages will stand a chance to win a 24K Gold Fortune Pouch Charm bracelet. 10 lucky winners will be selected weekly. Step 1: Purchase 2 tins of 700gram Julie's Love Letters from 8 Jan to 11 Feb 2018. Step 2: Write down your love message within 20 words on the Love Note. Step 3: Fill in your personal details. Step 5: Drop your contest form inside the giant Julie's Fudai at Julie's promotional block or post it to Julie's mailbox. 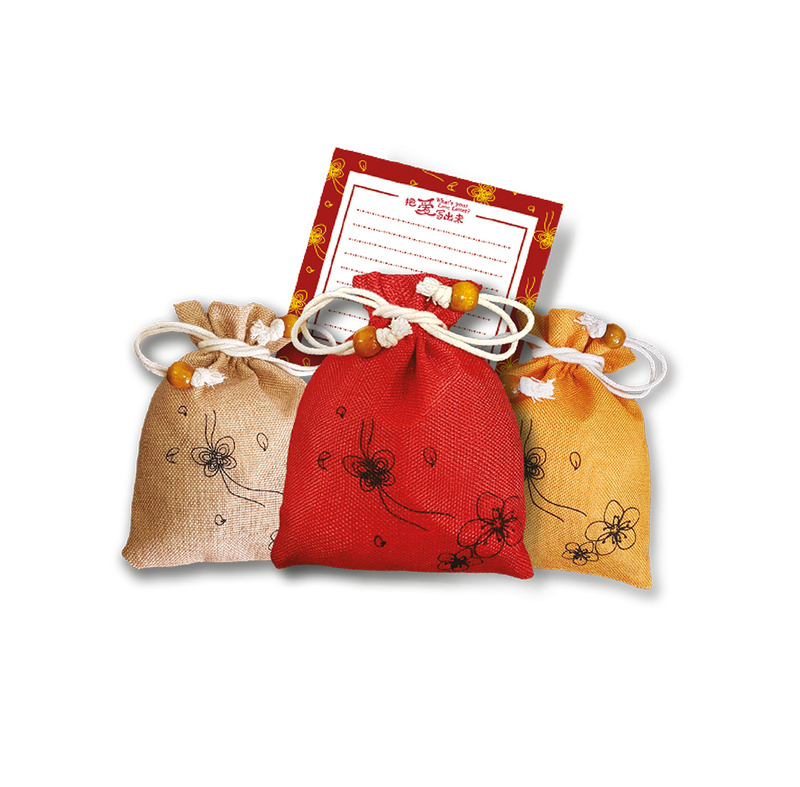 At 11am every Saturay during the roadshow, the first 88 customers who purchased 2 tins of 700gram Julie's Love letters will receive a FREE 400gram Julie's Love Letters and a limited edition "Fudai" woven bag! First come first served basis, while stock last. 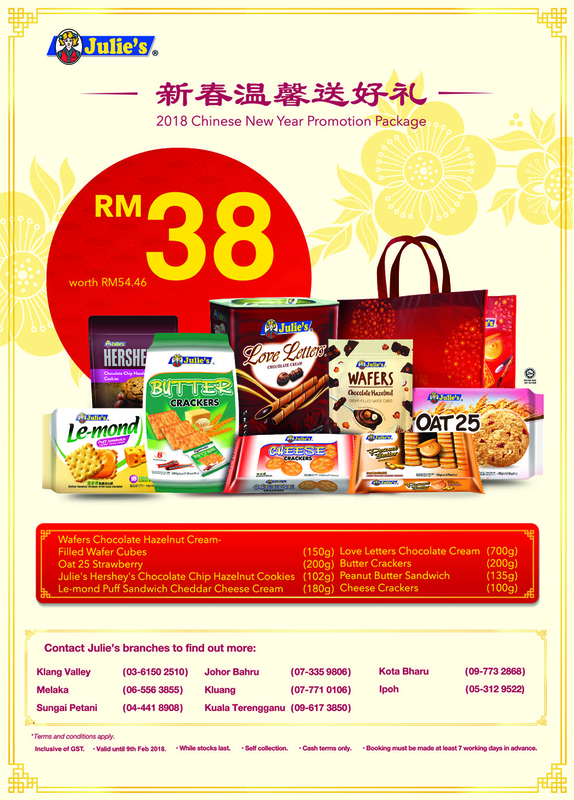 For more details, you can visit Julie's Biscuits Facebook Page.